You might remember a couple of weeks ago when I reviewed my beloved Charlotte Tilbury Dolce Vita palette that I mentioned I had found a very similar budget palette that I wanted to share with you. It is not an exact dupe, but it's pretty damn close & for the many people who don't have £38 to spend on an eyeshadow quad (or just don't want to! ), this might be just the product for you! The product concerned is from Rimmel & it is their Glam'Eyes HD 5 Colour Eye Shadow palette in Brixton Brown. Now obviously the packaging of the two products is miles apart & I must admit that the Rimmel packaging is very flimsy but at that price, I won't complain too much! Although my photo doesn't show it very well, the russet shade, which is in the centre of the Rimmel palette and the top right of the Charlotte Tilbury palette, is very similar - the CT one is slightly more brown in tone. The top left in the CT palette and top right in the Rimmel palette are almost identical, as are the bottom right in the CT palette & bottom left in the Rimmel palette. 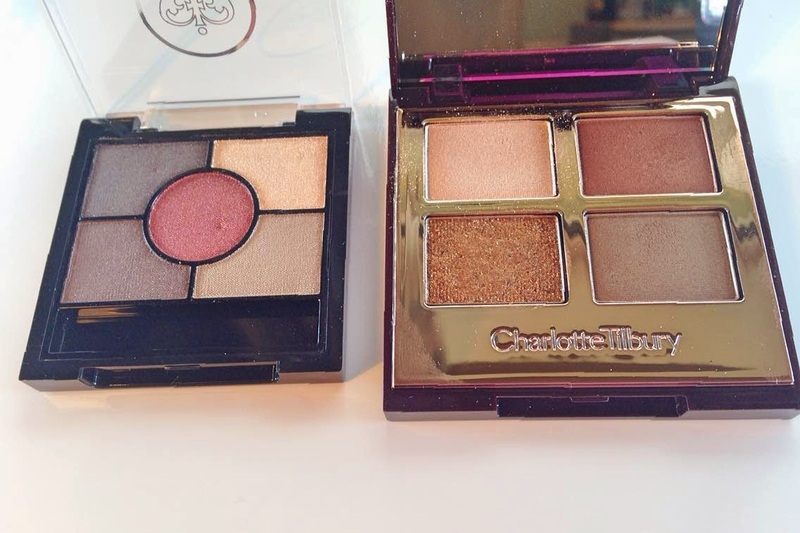 The obvious exception is the very pretty glitter shadow in the Charlotte Tilbury palette but apart from that, these palettes are very similar. The pigmentation of both palettes is excellent & the Rimmel shadows are almost as creamy as the CT ones. A primer would be essential to ensure the Rimmel palette would last as long as the CT shadows, but this is an excellent budget palette & definitely one to check out if you like the Dolce Vita but can't justify the price tag. Do you know of any other dupes for Charlotte Tilbury products? please let me know if you do! For £6.99, you can't go wrong! What a great find! I would love to spend on CT products, as I haven't had cahnce to try any yet, but seeing as the Rimmel palette is a great dupe, I think I will purchase that first!